Military radio and wireline communications equipment, and related stuff. For a long time, I’ve had a passing interest in radar antennas. Not so much the antennas themselves, but mostly their azimuth-elevation (az-el) drives. Every now and then, I’d search on eBay for any such az-el drives that looked both interesting and inexpensive, with or without antennas. I finally found one to buy about a month ago, and here’s a little bit about it. I’ve just obtained a WW2-style packboard with an MT-702/U radio mount fastened to it. It’s similar to the FT-505 pack mount that I wrote about previously, and a BC-1335 transceiver will fit on it. However, unlike the FT-505 which has a wide spot for the BC-1335 and a narrow spot for a CH-191 battery box, this MT-702/U has two wide spots, each of which is the right size for a BC-1335. I’m very happy to report that thanks to a NOS pair of Eimac 4-125A modulator tubes from Antique Electronic Supply, my T-368C is back on the air for the first time since I got it! I’ll still have plenty of tinkering to enjoy on it, and plenty of work integrating it into a full system with my R-390A receiver. I’m also happy that my antenna BALUN didn’t burst into flame upon encountering the hefty output of this small monster of a transmitter. My T-368C transmitter uses three impressively large transmitting tubes. The power amplifier (PA) uses an Eimac 4-400A, while the modulator uses a pair of Eimac 4-125A tubes. These big tubes are beautiful in my opinion, especially when they’re operating with the plates glowing red. Sadly, they’re not normally visible in operation due to the transmitter’s opaque steel cabinet, studded with interlocks to keep folks away from the lethal high voltage that lurks inside. Even with the interlocks bypassed for debugging purposes (which is dangerous, and should be avoided when possible! ), the big 4-400A tube is further obscured by an opaque metal chimney which ducts cooling air around it. I’ve made some good progress on my T-368C transmitter already. The arcing problems have subsided on their own, though they may come back later. I traced down the modulator problem to a single resistor in the speech amplifier which failed open, thus removing power to the clipper tube’s plates and breaking the audio path. The transmitter is now working on CW and AM at full power into a dummy load! I also replaced another resistor in the same speech amplifier circuit, but I think it was actually OK and I just had a measurement error due to residual charge in the circuit. The SCR-619 radio set could be deployed in several different configurations, including vehicular and man-portable. In a man-portable configuration, the BC-1335 transceiver and CH-191 battery box would be installed on a common pack frame with an FT-505 mount. These mounts seem to be quite rare, as I’ve only found about two or three collectors who have them or have ever seen one for sale. A few months before the 2010 West Coast Military Radio Collector’s Group annual meeting, Paul Thekan kindly loaned me his FT-505 so that I could photograph it, measure it, and display it with my SCR-619 set at the meeting. I didn’t just photograph it, though… I also created a 3D CAD model of it, with thoughts of someday fabricating a reproduction. I bought this amplified communications speaker at a military surplus swap meet. It’s a nice little powered speaker which is intended for use with manpack radio sets (particularly ones with digital data capabilities). It is powered by a 9V battery which fits in a sealed compartment at the bottom of the unit. It is housed in a rugged aluminum chassis, and has a pair of clips on the back which can be used to hang the speaker from one of the “roll bar” handles which are common on these manpack sets. The BC-1335 is an FM transceiver used in late World War 2, covering 27.0 through 38.9 MHz in 120 crystal-controlled steps. It is an improved successor to the similar BC-659 radio. The transceiver operates from either 6VDC or 12VDC, supplied from an external source such as a battery pack. The KY-38 is the manpack variant of the NESTOR family of voice security devices. Used during the Vietnam War, this family included the KY-8 vehicular unit, the KY-28 aircraft unit, and the KY-38 manpack unit. These devices permitted secure voice communications over radio. This particular unit has been demilitarized; that is, all of the cryptographic hardware has been removed from the unit before it was released as surplus, leaving only the case, power supply, interface circuitry, and an interesting electromechanical keying device. The battery box is also missing. Message Book M-210 was, as far as I have been able to determine, the standard form for recording message traffic during World War 2. A great deal of rigorous procedure was necessary to reliably route message traffic, and part of that procedure involved composing messages on the standardized carbon-copy forms in Message Book 210 prior to submission to message centers for routing. The same forms were used by message centers when transcribing messages (for example, after encrypting them with Converter M-209), when receiving messages sent via radio, etc. I bought this TBY-4 transceiver in November, 2007 for the princely sum of $26. I plan to retore it to operation, and I’ll add more information about it here… someday. In the mean time, here are some pictures. 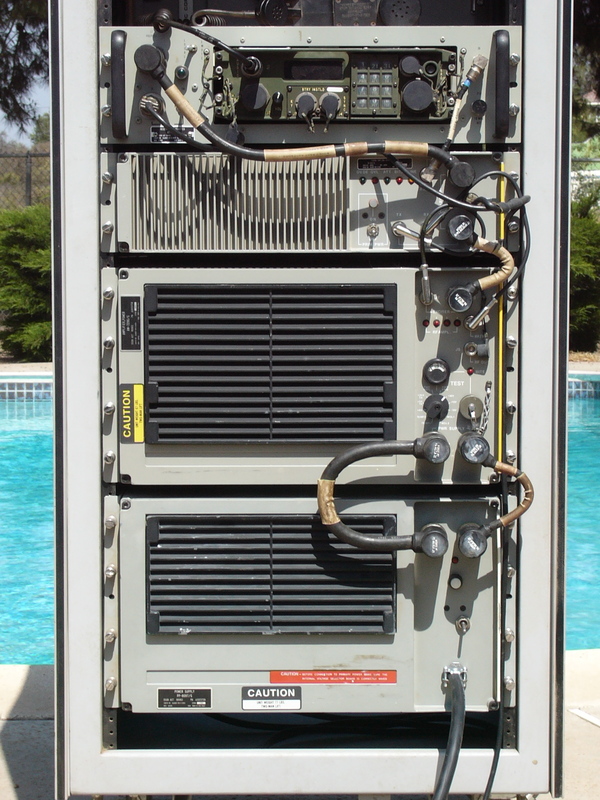 The AN/TRC-179 Force Terminal is part of the “Regency Net” system, which was a radio system fielded in the 1980s. Regency Net was designed to survive the electro-magnetic pulse (EMP) from a nuclear airburst. Thus, its members are a lot more complicated than other radio systems with similar capabilities, with lots of filtering on all electrical inputs and outputs. The set covers 2.0000 to 29.9999 MHz with LSB, USB and data modes. The Regency Net members include a frequency-hopping Electronic Counter-Countermeasures (ECCM) mode. The sets can function in single-channel mode with the ECCM card removed, and they were often deployed this way to non-military users such as FEMA. This conductive mesh suit was developed to protect people who need to work in strong RF fields emitted by Naval shipboard RADAR systems. It provides a minimum of 20dB of attenuation from 200 MHz to 10 GHz, in fields up to 200 mW/cm2. A complete set also includes rubber boots and gloves, a hardhat, and cotton over-clothes which prevent arcing between electrical equipment and the conductive mesh suit. Here are some pictures that I took at the 2007 West Coast Military Radio Collector’s Group meeting on May 4 and May 5 in San Luis Obispo, California. Here are some pictures that I took at the 2006 West Coast Military Radio Collector’s Group meeting on May 5 and May 6 in San Luis Obispo, California. I bought this radio at the 2006 West Coast Military Radio Collector’s Group meeting, and then later traded it away for something else. I bought this Chinese HF transmitter/receiver set from seller redstarradio on eBay back around March, 2005. It came as a complete new set including the manuals, spares, tools, test equipment, etc. that would normally be issued with the set, all in original packaging. It was a lot of fun to unpack a brand new complete radio set in pristine condition! The historian in me felt bad about destroying the original packaging, but I just had to play with the radio! I compromised by carefully photographing everything as I unpacked it, paying special attention to packaging methods and markings. Radar Set AN/PPS-6 is a lightweight non-coherent pulse Doppler combat surveillance radar operating in the X band between 9.0-9.5 GHz. When set up on its tripod, it allows the operator to detect moving objects at ranges of up to 1,500 meters (people) or 3000 meters (vehicles). The operator can measure the target range with a resolution of 50 meters. Transmitted RF power is generated by a magnetron tube, and the receiver local oscillator uses a klystron tube. It transmits pulses at a rate of about 2,000 pulses per second with a peak power of at least 100W and a width of 0.22-0.30 microseconds. An azimuth motor allows automatic scanning, and the motor may be disengaged for manual aiming. There is no display screen; the operator listens for the returned Doppler-shifted tone in the headphones, and reads out range on a mechanical counter after dialing in the range gate with a hand crank. The antenna is a 12 inch diameter truncated parabolic dish. The set operates either from an internal 12V silver-zinc rechargeable battery or an external 12VDC source.